Share market HIGHLIGHTS: Ahead of the outcome of the crucial board meet of the Reserve Bank of India, the BSE Sensex rallied over 300 points to end Monday's trade at over a six-week high of 35,774.88 points. The NSE Nifty surged 0.76% to end trade at 10,763.40 points today. Reliance Industries, ITC, HDFC Bank, Yes Bank, L&T, TCS, IndusInd Bank, HDFC and Kotak Bank were among the top index contributors. Share market HIGHLIGHTS today: Ahead of the outcome of the crucial board meet of the Reserve Bank of India, the BSE Sensex rallied over 300 points to end Monday’s trade at over a six-week high of 35,774.88 points. The NSE Nifty surged 0.76% to end the trade at 10,763.40 points today. According to market observers, positive Asian markets, along with foreign fund inflows and healthy buying in most FMCG, metals, pharma, realty, media, and auto stocks kept the market sentiment upbeat. Nifty successfully managed to close at 10763.40 up by 81 points. Today's close has reinforced the confidence for bulls. As stated earlier, we had a breakout in Bank Nifty from consolidation range 3 days earlier itself so today's breakout in Nifty was well anticipated. 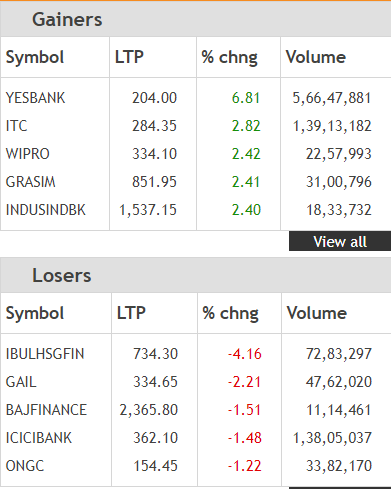 Bank Nifty has a muted session and closed up marginally 55 points lead by gains in Yes bank which closed up 7% due to retention in its Credit Rating. Banking sector is cautious ahead of the meeting between RBI and Government over disputes. The Agenda pertain to easy availability of capital to MSME sector, Liquidity issues in NBFCs and other governing issues. Investors have to see where does the Dispute end. Support for Bank Nifty is placed at 26100 levels and resistance comes at 26400. Shares of private lender Yes Bank soared as much as 7.6 percent to Rs 205.50, registering biggest intraday percentage gain since November 1, after ICRA retained its issuer ratings. The credit rating agency retained its overall long-term issuer ratings for the lender at AA+, with a rating ‘watch’ with developing negative implications, Yes Bank said in the exchange filing on Saturday. The stock closed at Rs 191.30 on Friday. The shares of the private lender closed 7.19% higher at Rs 205.05 per share on the BSE. Reserve Bank of India is open to the review of PCA Banks' Corrective Action Plan, but it would stay strict on bad loan norms, wire reports say. The reports also said the RBI wants the government to commit more for the health of PSU banks. Check LIVE updates of RBI Board meet here: Much awaited meet underway; stormy session or consensus? The BSE Sensex traded with appreciable gains during the late afternoon trade today, with the index climbing over 250 points to a day’s high of 35,723.38 points. 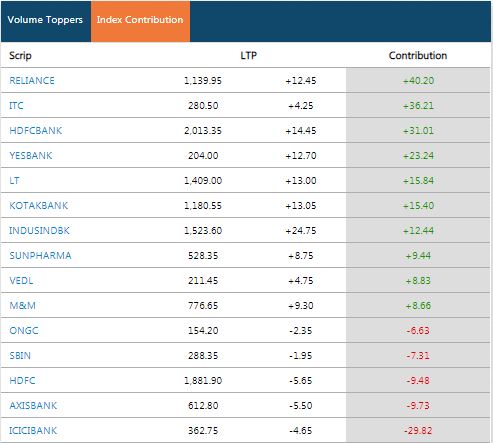 Reliance Industries, ITC, HDFC Bank, Yes Bank, L&T, Infosys and Kotak Bank were among the top index contributors. 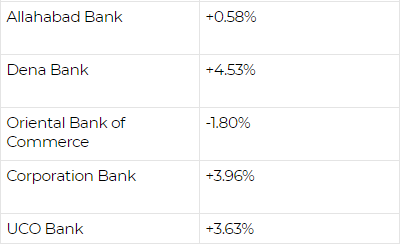 Yes Bank was the top gainers on the Sensex. Oil prices rose by around 1% on Monday amid expectations that top exporter Saudi Arabia will push producer club OPEC as well as perhaps Russia to cut supply towards year-end, said a Reuters report. Front-month Brent crude oil futures were at $67.41 per barrel at 0746 GMT, up 65 cents, or 1%, from their last close.U.S. West Texas Intermediate (WTI) crude futures, were up 76 cents, or 1.4%, at $57.22 per barrel. 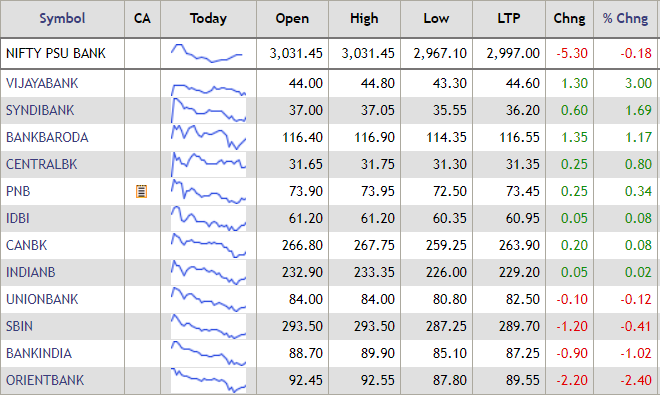 Reliance Industries, ITC, HDFC Bank, Yes Bank, L&T, Infosys and Kotak Bank were among the top Sensex contributors today. On the other hand, ONGC, SBI, HDFC, Axis Bank and ICICI Bank were the top index drags. In a bid to make it easier for retail investors to invest in government bonds directly, the National Stock Exchange has offered a mobile application and web-based platform — “NSE goBID” (Government Bond Investment Destination). “NSE goBID” and web-based platform for investing in government securities will be available to all investors registered with trading members of NSE, the stock exchange website said. The NSE goBID platform will be launched today by Ajay Tyagi, Chairman, Securities and Exchange Board of India (SEBI). Share markets turned mixed in Asia on Monday amid conflicting signals on the prospects for a truce in the Sino-U.S. trade dispute, while the Federal Reserve's newly-found concerns over the global economy constrained the dollar, said a Reuters report. MSCI's broadest index of Asia-Pacific shares outside Japan dithered either side of flat through a sluggish session. Chinese blue chips manage to add 0.5%, as did Japan's Nikkei. But E-Mini futures for the S&P 500 slipped 0.36% and spread betters pointed to modest opening losses for the major European bourses. Wall Street had firmed on Friday after U.S. President Donald Trump said that he may not impose more tariffs on Chinese goods after Beijing sent a list of measures it was willing to take to resolve trade tensions. However, Sino-U.S. tensions were clearly on display at an APEC meeting in Papua New Guinea over the weekend, where leaders failed to agree on a communique for the first time ever. Dollar index has completed 5 Elliot wave pattern on the daily scale and we expect DXY to test 96 levels. However, Indian Rupee may not appreciate despite weak dollar as crude oil prices have started rebounding. Brent crude is in an oversold region and is currently consolidating and making a base. Indian Rupee had also re-tested its support of 71.80 in Future and we expect Indian Rupee to depreciate till 72.25-72.30. Any more correction in Indian Rupee will only come below 71.60 in Future. Shares of Tata Investment Corp climbed nearly 8% to Rs 889.95 per share on the NSE after the company on Friday approved buyback of up to 45 lakh shares aggregating a sum of Rs 450 crore. The shares of Tata Investment rose to their highest since June 20. About 358,097 shares change hands vs 30-day moving average of about 51,887 shares. The stock is down about 7% this year, as of last close. The board of directors of the company at its meeting held Friday approved the buyback of the shares amounting to 8.17% of the total paid-up equity share capital at Rs 1,000 per equity share, Tata Investment Corporation said in a regulatory filing. Shares of Bharti Airtel fell over 4% to an intra-day low of Rs 319.25 per share on the BSE in early trade today. Vodafone Idea on Friday clarified that a news report on Bharti Infratel buying fibre assets of the company is "factually incorrect". Vodafone Idea shares were trading lower by 3.38% at Rs 41.45 per share on the BSE. 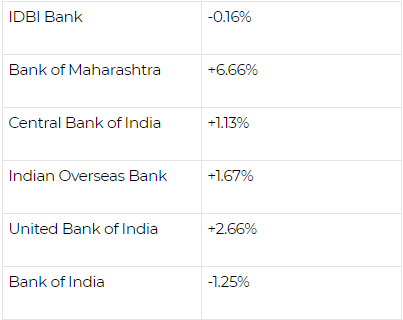 The Nifty PSU bank index traded in the red, with major PSU banks shares trading under pressure. SBI shares fell over 1% intra-day trade today. The BSE Sensex, which rose over 200 points in opening trade, trimmed some gains in the first half an hour today and traded 78.05 points or 0.22% higher at 35,535.21 points. The NSE Nifty slipped below the 10,700-level. Heavy selling pressure in blue-chip stocks like Bharti Airtel, Wipro, Asian Paints, SBI, Adani Ports and Axis Bank, among other stocks, pared some gains of the headline indices. The rupee depreciated by 9 paise to 72.02 against the US dollar in early trade Monday at the interbank foreign exchange, halting its four-day winning streak, ahead of RBI's board meet. Fresh demand for the American currency from importers amid rise in crude prices weighed on the domestic unit, PTI reported citing dealers. However, weakness in the US dollar against some currencies in global market and a higher opening of the domestic equity markets limited the rupee fall ahead of Reserve Bank of India's board meet. Yes Bank shares surged nearly 7% to a high of Rs 204.50 per share on the BSE today after reports said the search committee has shortlisted multiple names to succeed Rana Kapoor. A search panel entrusted with finding Rana Kapoor's successor to lead Yes Bank has shortlisted multiple names, including those serving a foreign as well as domestic lenders, PTI reported on Friday citing people in the know of the matter. Veteran banker OP Bhat, who was a past chairman of State Bank and one of the two independent members of the search and selection committee, had resigned last week over potential conflicts of interest. Jet Airways shares cracked over 12% to a low of Rs 303.25 per share on the BSE in early morning trade today after Tata Sons on Friday said no concrete "proposal" has been made by the group so far in acquiring the beleaguered airline. However, the Tata Group confirmed its interest in Jet Airways. The Tatas, which already run two carriers-- the full-service Vistara in a joint venture with Singapore Airlines (SIA) and AirAsia India in a similar arrangement with Malaysian carrier Air Asia--have widely speculated to be planning to acquire Naresh Goyal-controlled airline with it's the Singaporean partner, said a PTI report. The NSE Nifty opened on a strong note today. The index reclaimed the 10,700-mark, scaling an intra-day high of 10,732.25 points. Check out the most traded stocks by volume in the first 15 minutes of trade today. The BSE Sensex rose over 200 points in opening trade today, while the NSE Nifty reclaimed the 10,700-mark. Shares of Yes Bank rose over 4% in early trade. Jet Airways shares cracked 12% in trade today after Tata Sons on Friday said no concrete "proposal" has been made by the group so far in acquiring the beleaguered airline. The BSE traded 212.77 points or 0.60% higher at 35,669.93 points during the pre-open session on Monday. The NSE Nifty traded above 10,700-mark. The rupee opened on a flat note at 71.9312 vs the US dollar against its previous close at 71.9250 per dollar, Bloomberg data showed. US stocks fell this week as heavily weighted technology and Internet shares continued to perform poorly. Amazon.com shares entered a bear market on Monday, down over 20% from the all-time high they established in late August. Apple, which accounts for 12% of the Nasdaq Composite and 5% of the Dow Jones had its worst week in seven months on concerns about disappointing iPhone sales and slower growth. Crucial RBI board meeting is scheduled today where contentious issues like relaxing norms for PSU banks in PCA and transfer of RBI’s reserves will discussed. Government wants to ease liquidity in the system to be able to meet adequate loan demand to bolster growth and encourage job creation. There are hopes that both find a middle ground and resolves the issues amicably. Banking sector will continue to hog limelight this holiday-shortened week. Nifty will attempt to take out 10800 barrier on the higher side while support for the index comes in at 10400 level. Share market on Friday: The domestic stock market closed higher on Friday buoyed by a strong rally in IT and financial stocks. The Sensex closed 196.62 points up at 35,457.16, while the broader Nifty 50 closed at 10,682.20. Shares of RIL gained more than 3% to Rs 1,129.95, to pip IT behemoth TCS and emerge as India’s most valued company.